70,000 people came and went where none were before. A place so barren it is without insects, and yet I saw a hawk swooping through our camp at dusk. Black Rock City. A place like no other on earth. You have either been there and know it, or you are an outsider. There is no in between. There is no place I feel more alive, more insane, more in touch with the emptiness inside my own soul. That personal struggle to add meaning to an intrinsically meaningless life. I didn’t want to go, but I had already bought a ticket and a plane ride, there was no turning back. 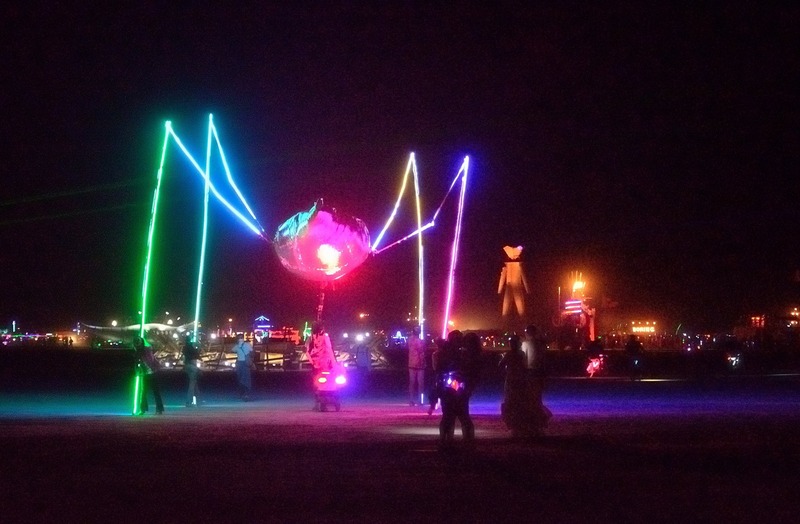 Doug and I planned for months to build a giant 22 foot walking puppet bug we were going to stride across the playa with. I knew it would be a nightmare building it there, it always is. I knew the wind would make our lives miserable as we tried to cart around this giant creation. Last year I built a 43 foot tall puppet man and moved it around with 6 others on guide wires. I swore never again, but here I was building this bug in the middle of nowhere, right back at it again.